Ford Fry has a knack for creating likable, trend-driven restaurants that I’ve found capable but overly safe. His first, JCT Kitchen & Bar in the Westside Urban Market development, opened in 2007. Its tame versions of shrimp and grits, chicken and dumplings, and deviled eggs draped with ham helped usher in the era of that now-cliched genre, Southern farm-to-table, but they lack gutsy soul. Fry—who worked at several Ritz-Carlton properties around the country, as well as the high-end carryout chain Eatzi’s, where he no doubt picked up pointers on corporate strategy—shrewdly scanned the dining scene and noticed a dearth of sophisticated seafood. I field near-daily requests from readers looking for stellar fish and shellfish, so I’m not surprised to see the dining room filled with a cross section of the city: the requisite gastronomes and the Buckhead glitterati, but also black and white families, gaggles of twenty-somethings, even octogenarian couples. Atlantans like their high-volume restaurants themed, and how refreshing to find a space that whisks us off to the beach rather than Studio 54. Fry and Smith Hanes, the designer who also crafted the farmhouse-chic looks for JCT and No. 246, outdid themselves with an elegant, subtly nautical redo of a Westside warehouse crowned with an evocative vaulted ceiling. You enter through the cozy oyster bar and then turn right into the vast main room, anchored by a glittering wall of backlit bottles on one end and by the semi­open kitchen gleaming with white tile on the other. To helm the restaurant’s wood-fired ovens, Fry wisely hired from within his own ranks. Executive chef Adam Evans grew up fishing with his family in northern Alabama. He came to Atlanta via Buckhead’s now-defunct Craftbar, after four years at Tom Colicchio’s flagship Craft in Manhattan. Fry first hired Evans as chef de cuisine at JCT, but he recognized a talent rangy enough to orchestrate the menus at the Optimist (which, by the way, is named for a type of dinghy). Evans’s philosophy mirrors Craft’s winning formula: Prepare quality proteins simply, then enhance them with spare but often disarmingly bold ingredients in a way that tastes distinctly, proudly American. Jump in with a glass of white wine—a flinty Spanish Albariño perhaps, or a minerally Australian Verdelho—or one of beverage director Lara Creasy’s spunky cocktails like the Truth As We Know It, an herbaceous riff on a martini. Leave the knife and fork alone for now: Start by slurping down oysters, focusing on the creamier and more unctuous specimens from the West Coast, such as Naked Roy’s Beach out of Washington’s Puget Sound. Work your way through the condiments: a judicious squirt of lemon, a mignonette with just the right vinegar kick, a few shakes of cloudy, homemade hot sauce. Sully your hands with plump peel-and-eat Georgia white shrimp swiped through an uptown version of “come back” sauce, a tangy mixture based on mayonnaise and ketchup. Your fingers will be even messier if you order the same white shrimp cooked “a la plancha” (griddled) and doused with a creamy tomato sauce revved with arbol chile and lime. Now bite into a fried clam roll, the crisp, briny morsels enlivened by the rat-a-tat-tat of kimchi vinegar and sour-sweet pickles. Suddenly Atlanta doesn’t feel so landlocked. Entrees started as the menu’s weak spot (undersalted flounder and halibut on early visits, and a silly breaded skate wing “schnitzel” that happily disappeared), but are gaining in confidence and skillful execution the longer the restaurant is open. An odd but daring duo of seared rare tuna and charred octopus succeeds as an essay on contrasting textures, with pickled mustard seeds and a mild version of harissa, the spiced North African chile sauce, binding the flavors. I love the bone-in monkfish, its lobstery flavor tasting so summery against pureed and sauteed corn and the licorice nip of basil leaves. Don’t overlook the seafood-friendly sides. Most include revolving seasonal produce, but my favorite is a jumble of basmati rice with smoked fish, crushed peanuts, and egg, gently accented with curry powder, that’s a play on a British dish called kedgeree (which in turn is a take on an Indian lentil-and-rice staple known as kitcheree). 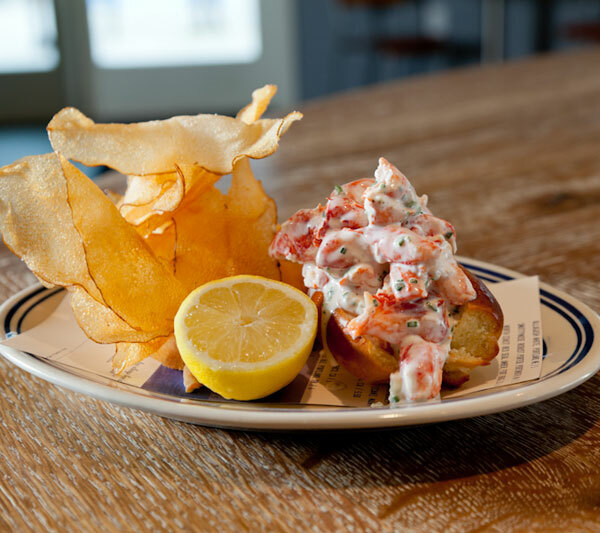 The Optimist’s lobster roll—served at the adjoining oyster bar during dinner, and both at the bar and in the dining room during lunch—may be the finest in Atlanta. No flavored mayo or other shenanigans: A buttery roll cradles sweet, fleshy lumps, and a side of translucent, satisfyingly greasy chips completes the seashore reverie. The seventy-seat oyster bar and its shaded patio hold their own as a separate draw. Down a few raw and roasted oysters and then savor pastry chef Taria Camerino’s sundae with vanilla ice cream, pound cake, fried peanuts, and chocolate sauce while chilling out on a weekend afternoon (the bar opens at 3 p.m. on Saturdays and Sundays). I hope its eight-option wine list grows in scope, but in the meantime I’ll content myself with the rummy, not-too-sweet fish house punch. In the last two years, Fry has emerged as the decade’s most ambitious chef-restaurateur. He’s already at work on his next project: a Colonial America–themed tavern, due to open early next year, in the space of Buckhead’s long-standing Nava, which is closing this month. HOURS Lunch Monday–Friday 11:30 a.m.–2:30 p.m.; dinner Sunday–Thursday 5–10 p.m., Friday–Saturday 5–11 p.m. Oyster bar hours Monday–Friday 5 p.m.–close, Saturday–Sunday 3 p.m.–close. Photographs by Patrick Heagney. This review originally appeared in our September 2012 issue.